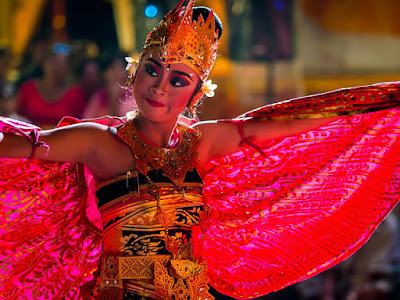 Dancers mimic the motions of a bird during evening dance performances in Ubud. Olympus E-P5, 17mm f1.8 lens, 200ISO, f4 at 1/5 of a second shutter speed. 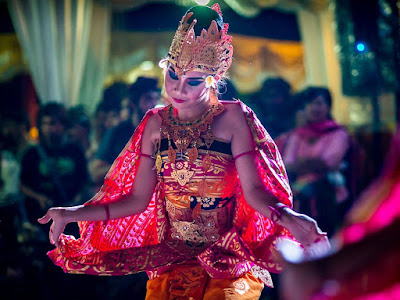 Bali is an island of ceremony and ritual. 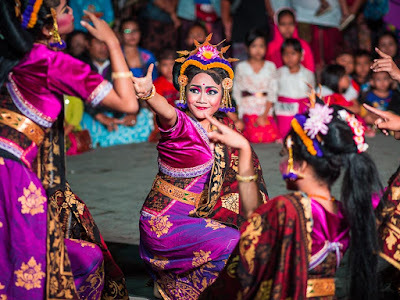 I timed my trip to the island paradise around the mass cremations that are taking place across the island this year (summer in the northern hemisphere, winter in Bali, which is below the equator). 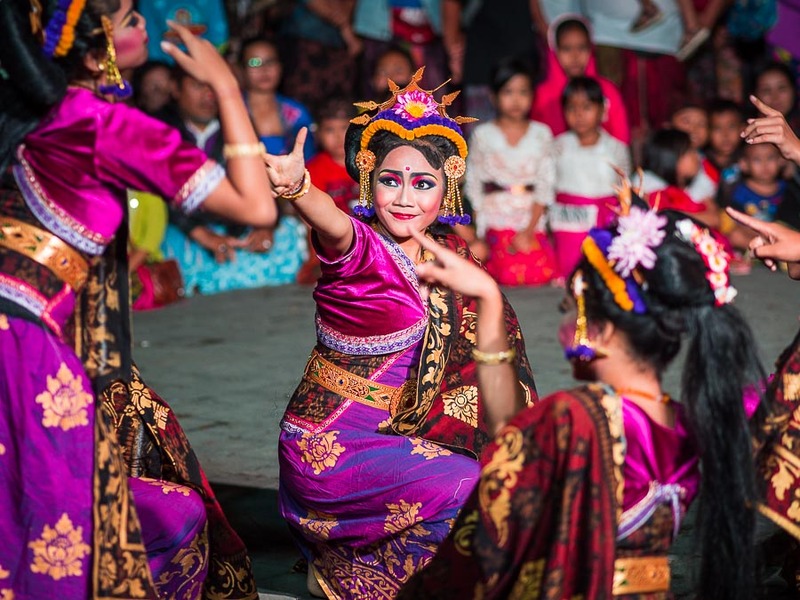 One of the activities I covered was a traditional dance at the cremation site in Ubud. 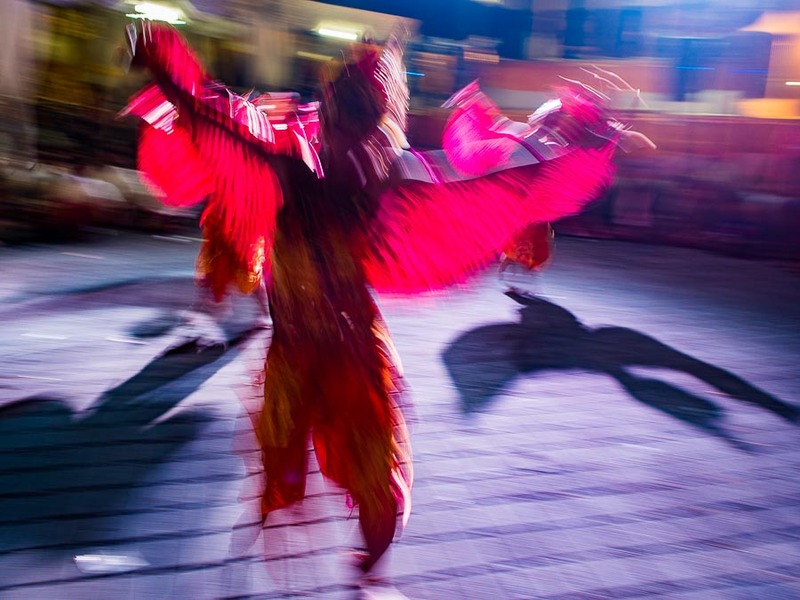 The dances started about 9pm at the plaza where families of the people being cremated were staying. The challenge for covering something like this is that it was extremely dark and as good as the current Olympus Micro 4:3 cameras are, they are still not the high ISO masters that the full frame Canon and Nikon cameras are. I usually have to apply extra noise reduction when I take the Olympus cameras above ISO1600. That's why I used flash for the backstage photos of the dancers relaxing before the performance. They knew I was photographing them (it's hard not to notice me when I'm carrying a camera bag and holding a flash at a ridiculous angle) but the girls were so focused on their Facebook updates (Pokeman GO hasn't hit Indonesia yet) that they didn't care. The boys started posing for me but grew bored and went back to their normal posture when I kept photographing. In both cases, I pulled out my Fuji Instax camera and gave them the little instant prints from the Fuji when I finished. The top photo, the slow shutter speed blur photo of the dancer, was made because this particular scene was very backlit and to get a movement freezing exposure of 1/160 or higher would have required an ISO of 1600 or higher. When handed a basket of lemons I chose to make lemonade. These pictures were made from the same place as the top picture and it's easy to see how backlit the photos are. (E-P5, 75mm f1.8 lens, ISO1600, f1.8 at 1/160 of second.) This is why I use prime lenses more often than zooms. With the excellent Olympus 40mm-150mm f2.8 zoom I would have been forced to raise the ISO or lower the shutter speed. Higher ISO would have meant more noise, slower shutter speed have meant more unintentional blur. I started photographing the dance from the front of the crowd. The lights were on stands in front of us, blasting the light into our faces, and the scene was completely backlit. During a break in the dancing, I moved to the other side of the stage and stood under one of the lights. Now the scene was front lit, I wasn't blocking the view of any spectators and it was, in general, a more comfortable place from which to work. Photographing an event like this means putting yourself out there. For the top photo, the blurred photo of the birds, I had to stand up, blocking the view of the people behind me. I set the camera, waited for the action I wanted, then stood up quickly made some pictures and crouched down again. For the telephoto photos of the dancers from the same spot I, stood for some and crouched down for others. When I was standing I worked as quickly as I could, conscious of the fact that I was blocking people's view of the dance. It was much easier to work from the reverse angle, near the lights. I was standing in front of a stage with no spectators around me and not blocking anyone's view. I could stand or crouch at my convenience.